The rich South Texas Mesquite and chrome fittings really set off the turquoise acrylic center. As a big fan of Navajo jewelry, I really like this pen's reflection of Southwestern culture. This gorgeous pen is the perfect VIP gift when presented in its protective black velvet, drawstring gift pouch. It's also an elegant pen for women (or men who like some style in their life). 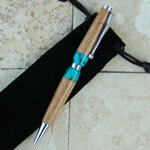 Learn more, or order this turquoise and mesquite pen at The Texas Penwright. The original "Taking Texas with Me"(tm) pen. 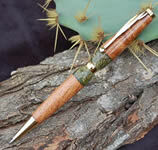 The Hill Country's favorite "Taking Texas with Me"(tm) pen.